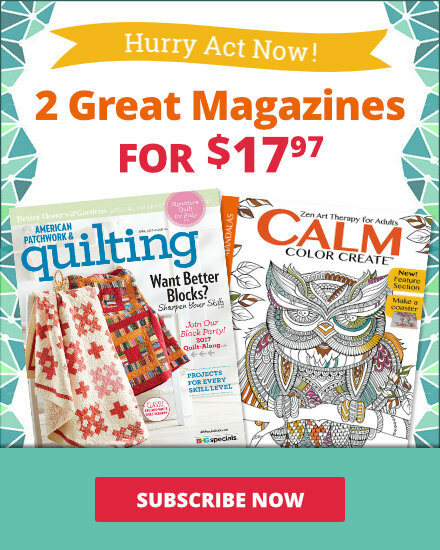 See the featured quilts and web-exclusive color options and projects from the American Patchwork & Quilting February 2015 issue. 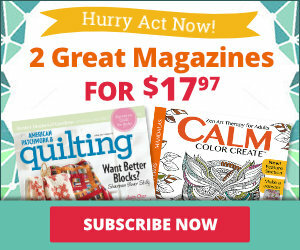 The February 2015 issue of American Patchwork & Quilting is on sale from December 2--February 3. After years of adapting to make-do studios, quilt designer, author, and instructor Kimberly Einmo revels in her ultimate quilting space. Piece a cozy throw one unit at a time. A touch of wool appliqué creates a peaceful wintertime scene. An airplane print and a diagonal stripe in an unexpected color palette results in a vibrant baby quilt. 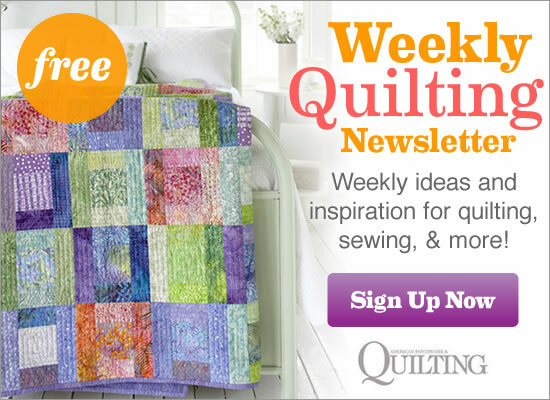 Straight line quilting and repeating the stripe in the binding provide fun finishing touches. Jean Wells teaches you how to expand your piecing horizons with a new technique -- freehand curved piecing -- and shows you how to play with color. After studying hundreds of Norwegian knitted sweaters, a designer creates a quilt that captures their essence. Triangle-squares, rectangles, and strips compose the “stitches” in this two-color beauty. Take Sweater Weather into another season with spring colors. The arrow units become tulips in a field of grass in this wall hanging version. Laura fussy-cut a dot for some of the pieces in the block row and used a stripe to direct the eye toward the blocks, which take on the look of stars instead of snowflakes. Whether you have a dedicated sewing room or fit all of your sewing necessities into a drawer at work, you have something in common with one of our staff members. 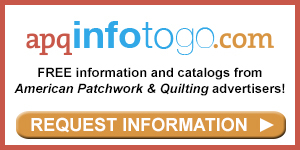 See how the folks at American Patchwork & Quilting magazine keep it all in order. 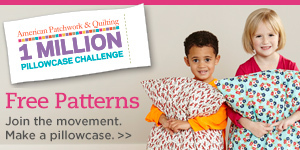 Rectangular blocks that look like paper lanterns are easily made with foundation piecing. Watercolor prints sparkle against cool blue tones to create the impression of lanterns floating on a lake at night. Civil War Era fabrics look lovely in these blocks, which are a variation of a Lady of the Lake block. Set off the on-point blocks with setting triangles in a deep red print. Solid black setting and corner triangles bring drama to a quilt center of light and medium prints. The teal inner border and a standout lime print add a fresh feeling to this wall hanging. Neutrals and curved piecing pack a subtle punch, creating the appearance of a diagonal grid superimposed on one that is straight-set. Color-rich jewel tones bring the circular shapes in this wall hanging to the forefront. The four identical button blocks prevent the multiple colors from being overwhelming. Use needle-turn appliqué and hand embroidery to craft a scrumptious wall hanging or table runner. Frame the appliquéd center with a kitchen-theme novelty print as quilt tester Laura Boehnke did in her wall hanging version of Place Setting. She used fusible appliqué and finished each piece with a narrow satin stitch. In addition to using the original quilt’s 5-1⁄2"-wide finished top and bottom borders, Laura added 1-1⁄2"-wide finished side borders. Ombré fabrics—cut and precisely placed—result in a throw that dazzles the senses. Brown squares separate color groupings of neutrals and light turquoise in a wall hanging that is a mirror image both horizontally and vertically. Reduce the size of a block and see how the look changes. Here, the block from Ladies in Red is scaled down to make a spring table topper.